Motorists who smoke at the wheel could be prosecuted under a new rule in the latest edition of the Highway Code. Smoking drivers would be charged if it is thought they were driving without due care and attention. Road Safety Minister Jim Fitzpatrick said drivers should not be distracted by other activities behind the wheel. 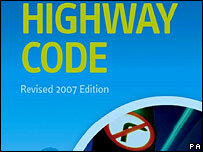 The first update of the Highway Code for eight years, which is 42 pages longer and has 29 more rules, includes a new safety code for novice drivers. Mr Fitzpatrick told BBC News: "What it says is that drivers should remember they have to concentrate and they shouldn't be distracted either by passengers, by loud music, by reading a map, or using a mobile phone or by smoking. "If you're lighting up with one hand and have a fag in the other hand then obviously you've not got any hands on the wheel. "So I think what we're saying is concentration is very important in the prevention of accidents." The driving booklet takes into account new laws over vehicle emissions and smoking in vehicles that are considered workplaces. New initiatives such as quiet lanes, high-occupancy vehicle lanes, home zones and active traffic management schemes are also included. Mr Fitzpatrick said the Highway Code was a "crucial tool for all road users" and was for life and not just for passing the driving test. Andrew Howard, head of road safety for AA Public Affairs, believed motorists would be divided over the new smoking guidance. He said: "A major change is the code's inclusion of smoking at the wheel as behaviour that police may interpret as a distraction and failure to be in proper control of the vehicle. "This addition will polarise drivers' opinions both for and against." Campaign group Forest described the new smoking rule as "totally unnecessary". Director Simon Clark said: "There are already rules concerning reckless driving and if it can be proved that somebody has driven recklessly they can be prosecuted. "There's not a shred of evidence that smoking is a cause of accidents, or any more of a distraction than changing a CD or air-conditioning controls. "Our concern is that they say it's just a guideline now but within a year or two there will be people who say 'let's ban smoking while driving'." Anti-smoking organisation Ash said it strongly supported the move. Research manager Amanda Sanford said: "Clearly, smoking while driving can be a distraction and could lead to accidents if people drop the cigarette or drop the ash. "The way it's phrased in the Highway Code is that drivers should avoid being distracted by smoking while they're driving. "It seems to be a perfectly sensible measure because the whole business of lighting up involves taking your hands off the wheel, so you're not driving with due care and attention."